The ‘James’ Alpine Adventure race can be completed solo or as a team in 4 formats. 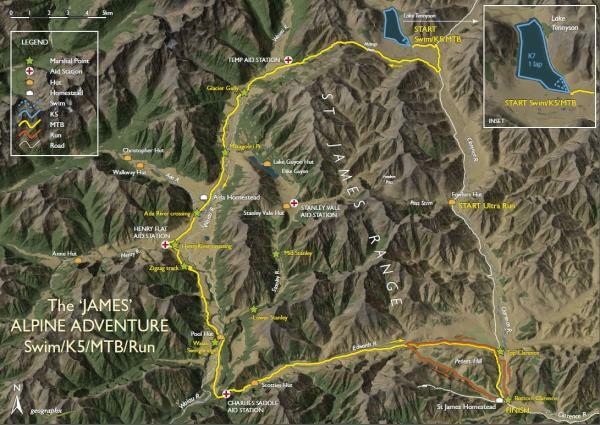 The “James” Alpine Adventure race is an R15 event. All race options are open to individuals and teams.All race options are open to individuals and teams. Race start 8:00am start with briefing at 7:45am. Mountain Bike stage - Pony Express course. Competitors can expect very hot conditions – be prepared and stay adequately hydrated. There will be marshal stations at various points but this is remote country so all competitors will need to be self-sufficient and should carry enough food/liquid for a whole day – all rivers & creeks should be ok to drink from directly. The 1.5 km swim leg and 7 km kayak stage are both in Lake Tennyson – IT WILL BE COLD so full body suits are compulsory for all swimmers. As part of the Didymo control ALL individual competitors MUST change and dry off completely in the transition zone before starting their MTB stage. After completing transition formalities competitors will start the 64 km Mountainbike leg. This follows the same course as The Ground Effect “James” Pony Express all the way to the 2nd transition zone at St James homestead. Starting from the transition at Lake Tennyson, riders will follow the 4×4 track (think “Duel Single Track” – DST) to the top of Malings Pass, from where they can enjoy a solid 5km downhill descent to the Waiau River. From here the DST crosses the river (at Glacier Gully) and continues for a couple of km down the Waiau valley toward the historic Ada homestead. Passing around below the Homestead riders traverse across the lower Ada flats to cross the Ada River and enter the lower Henry Valley. Crossing through Delta Creek riders will cross the Henry River and join the stock track up over the Zigzag and down the Waiau Valley to cross the lower swing bridge. Joining the DST, riders will climb up the Waiau terraces and up over Charlie’s saddle to follow the 4×4 track up the Edwards valley (crossing the river 3 times) where (at around the 60km mark) they will have one last short-sharp climb up out of Bull Gully before decending down to the Edwards gate at the Clarence where they will follow the road back to the final transition at the St James Homestead. After completing transition formalities competitors will start the 17 km run. Leaving the transition runners will travel around below the St James Homestead to cross the Clarence River, from here they will run up the river valley following the old transmission tower access tracks up to the Edwards gate. While there will not be any compulsory gear to carryon the run stage, it is very strongly recommended that runner’s carry some form of hydration of 2l capacity or more! There will be a mini aid station at Bull Gully (at approximately the 14.5km mark). Spot GPS trackers are highly recommended – These are live trackers so all your mates can watch your progress online at home.